Just to let you know that we have started gardening again (when weather permits). Tuesdays 10.00-11.00 meeting at the Salvation Army in Hunter Lane. 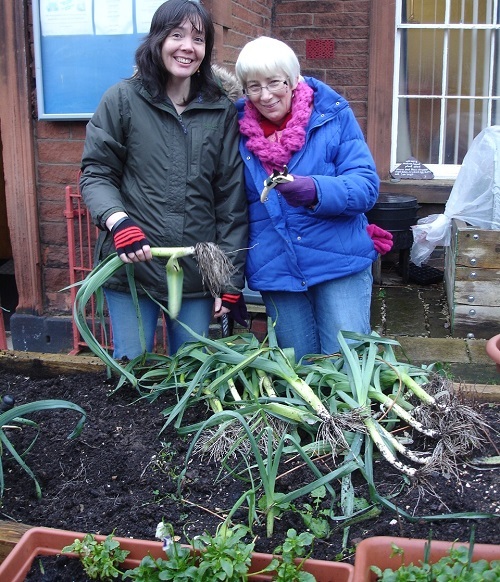 We hope to garden there in the raised beds and peace garden and around town in our other planters for an hour and then meet back at the SA for group coffee at 11.00. We also garden at other times when there are jobs to do. We have joint gardening projects to consider as well, including ways to encourage home growing and healthy eating. Anyone is welcome to join in and help to make our town look even better. Also a chance to grow fruit and veg and be supported by folks who know how to do it! If you could spread the word that would be helpful. No skills required, its very sociable and we can organise different times to meet. Also we hope to set up a free fruit and veg surplus 'bring and take' somewhere this year.. your ideas on how this could be done are welcome. 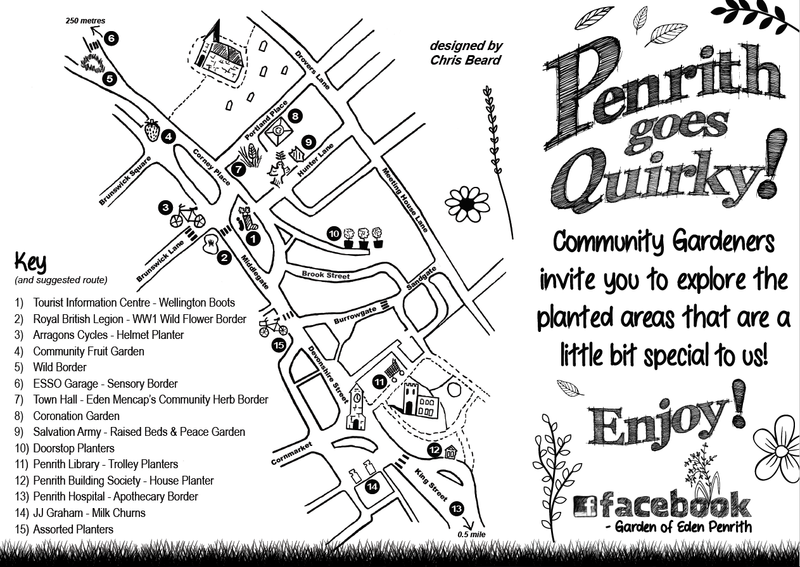 As part of Penrith on a Plate on 16th July 2016 at 11am, join Penrith community gardeners for a 45 minute tour of the community gardens and quirky planters. Sheila MacDonald holding the RHS 'It's Your Neighbourhood' Level 4 Certificate with some of the volunteers at the Stricklandgate Community Fruit Garden on Sunday 8/9/13 giving away over 200 strawberry plants, rhubarb, cooking apples and tulip bulbs. Please get in touch using our contact form or chat on Facebook - PACT or Garden of Eden. Can we grow more in the Garden of Eden? Can we grow more food in our own garden or backyard? Would you like to grow food with other people? Consult our "Grow-you-own" calendar to find out what to do now. With the help of many, including Eden District Council, we're looking for more beds, plots and fields for you to take over! Please get in touch with ideas of places to grow - and people to do it! Please take photos and send them through - get names and permission please! Follow these simple instructions to grow your own pea salad on your windowsill. 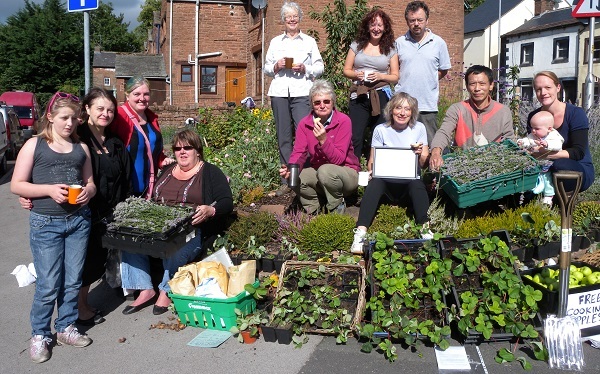 Penrith and Eden District Freegle is encouraged people in Eden District to give away any unwanted seeds, plants, trees or surplus produce for free by providing a gardening category of message posts. 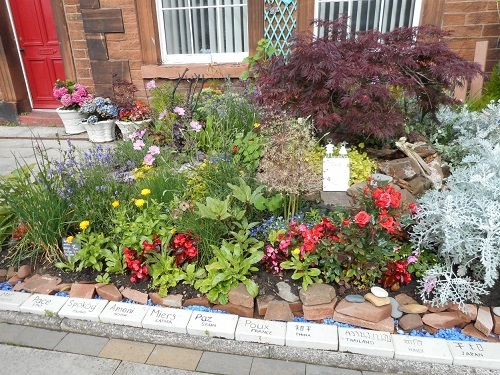 This is part of the Sustain Eden project run by Cumbria Action for Sustainability over the three years until September 2015, funded by the Big Lottery. Freegle worked with PACT to produce films such as that for Apple Day 2012. More Info. The Garden of Eden project helped Penrith win two trophies at Cumbria in Bloom 2012 - see the Greening Penrith project for more details. November 2012: the trophies are currently on display at the Penrith Tourist Information Centre. And here's the Incredible Edible Lancaster story. 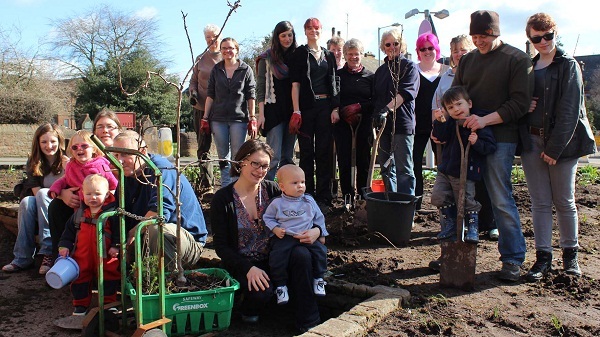 The Stricklandgate Community Fruit Garden inc photos. Eden District Council have identified seven free plots of land that could be used for community growing or allotments. Get in touch for more details. ﻿Vista Veg is a small grower's co-operative based in the village of Crosby Ravensworth near Shap in Cumbria. We grow high quality, responsibly grown vegetables on 3 separate sites totaling 6 acres for people who care about where & how their food is produced. We do this through a box scheme for families and individuals, and through wholesale supply to businesses and community groups. The website landshare.net helps you Find land, Offer land or Help out. Should we set up a Garden Share scheme here? If you are want to Buy, Grow, Eat or Cook in Cumbria, visit Foodlink Cumbria. Roe Baker would love hear what you enjoy about food and growing - and give you hints on how to get involved. There may be a field available for community use in Lazonby - contact us for details. Jane from Wild & Fruitful may be able to pick and use any fruit or veg that you have spare - and give you some of the resultant produce. Garden Organic maintain a Heritage Seed Library. If you join, you can receive old seed varieties to grow and pass on to others. Chris Cant and Caz Walker usually have Asparagus Kale seeds (originally from the library) to pass on for free.